If you have a financial interest in or signature authority over one or more financial accounts, including bank accounts, brokerage accounts, mutual funds, foreign trust, or other financial assets located overseas, exceeding certain threshold amounts, the Bank Secrecy Act may require you to report the account yearly to the U.S. Department of Treasury by electronically filing a Financial Crimes Enforcement Network (FINCEN) 114, Report of Foreign Bank and Financial Accounts (FBAR). Many recent immigrants to the United States of America may not know much about the FBAR reporting requirements. And many U.S. citizens or lawful permanent residents residing overseas may not know that they too must comply with the FBAR requirements if they meet the reporting thresholds. Failure to comply could expose U.S. Citizens and Lawful Permanent Residents to severe penalties. Criminal and Civil fines could apply. Act right away, and consult legal counsel if you have signature authority or ownership interest in foreign financial accounts and offshore assets. The deadline for filing the current FBAR is June 30, 2015. This is a mandatory filing if you are subject to the FBAR filing requirements. If you have missed an FBAR filing requirement in the past; you might qualify for an IRS Amnesty Program that could permit you to come into compliance with FBAR reporting requirements. 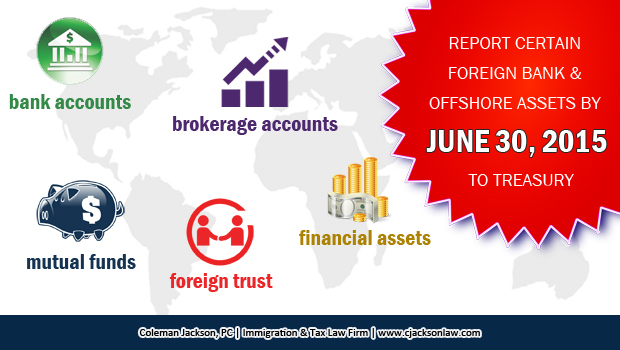 This entry was posted in Offshore Assets and Accounts Disclosure, Taxation on June 29, 2015 by Coleman Jackson. Residency is defined pursuant to the definition established by the United States and the country in question. U.S. tax laws do not overrule an applicable treaty’s definitions of residency. Treaties between the U.S. and foreign countries can change the results of U.S. federal tax laws. If a taxpayer’s residency is determined by an applicable treaty, the taxpayer must file Form 8833, Treaty-Based Position Disclosure Under Section 6114 or 7701(b) of the Internal Revenue Code. In some instances, a taxpayer may be a citizen of the United States and another country under both countries tax laws; in which case, the taxpayer is a dual citizen. Dual citizens who take a tax treaty-based position under U.S. Federal Tax Laws must timely disclose the tax-treaty position when filing Form 1040NR, U.S. Nonresident Alien Income Tax Return or Form 1040NR-EZ, U.S. Income Tax Return for Certain Nonresident Aliens With No Dependents. Dual residents taking a tax-treaty return position must compute their tax as a nonresident alien. They must also file Form 8833. Under 26 CFR Chapter 1, Section 301.6114-1, a taxpayer is considered to have adopted a “return position” when the taxpayer determines its tax liability with respect to a particular item of income, deduction or credit. It does not matter whether a return was filed. In other words, even if the taxpayer does not file a U.S. tax return, under U.S. tax law, the taxpayer has taken a “return position”. 26 CFR Chapter 1, Section 301.6114-1, treaty based return position applies if the taxpayer takes a return position that any treaty of the United States (including, but not limited to, an income tax treaty, estate and gift tax treaty, or friendship, commerce and navigation treaty) overrules or modifies any provision of the Internal Revenue Code and thus effects or potentially effects a reduction of any tax incurred at anytime. If a taxpayer adopts a “treaty-based return position”, the taxpayer’s residency dictates how the taxpayer is required to disclose their return position as discussed above. In the event the taxpayer concludes that a return position is not a treaty-based position, and decides not to follow the disclosure requirements of Section 301.6114-1; the taxpayer, if challenged by IRS correspondence, IRS field auditors or otherwise, must show that it has a substantial probability of successful defense of its return position. This entry was posted in Taxation on June 16, 2015 by Coleman Jackson.